As summer fast approaches my mind has turned to getting the garden ready for the summer. Both James and Evelyn love being out in the garden and now that Evelyn is a little older this year and can really get around outside and enjoy it I wanted to make sure they had plenty to play with. 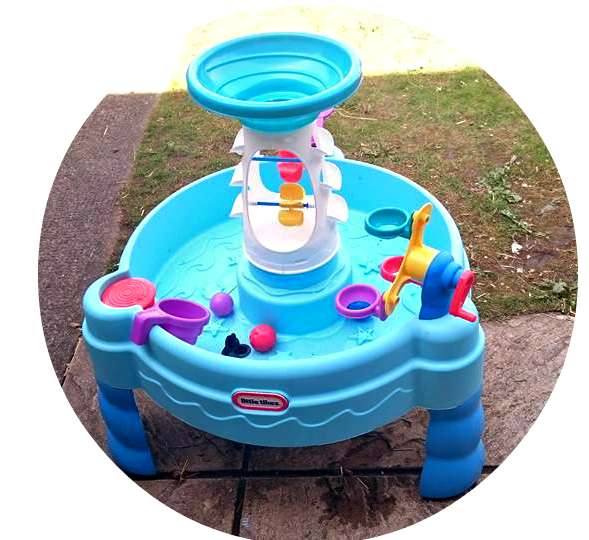 So when the lovely people at Little Tikes offered us a Spinning Sea's water table to try out we couldn't wait for it to arrive. If the splashing they do in the bath is anything to go by I knew it would be a big hit! When the spinning sea's water table arrived it came in several pieces with clear to follow picture/text instructions. Its pretty simple to put together though with most pieces just clicking in to place and only a few screws needed to hold together the centre column, then it was ready for the kids to play. 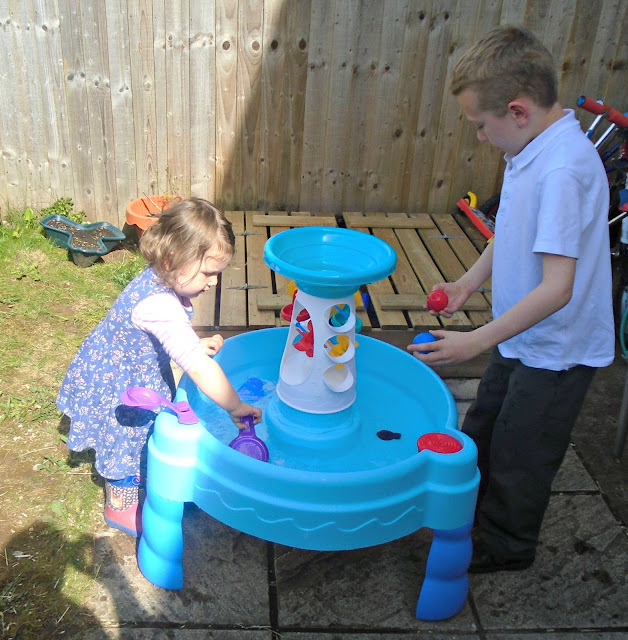 The water table is made of sturdy plastic with a smooth finish and chunky plastic legs which provide a stable surface and the perfect height for little people to play. 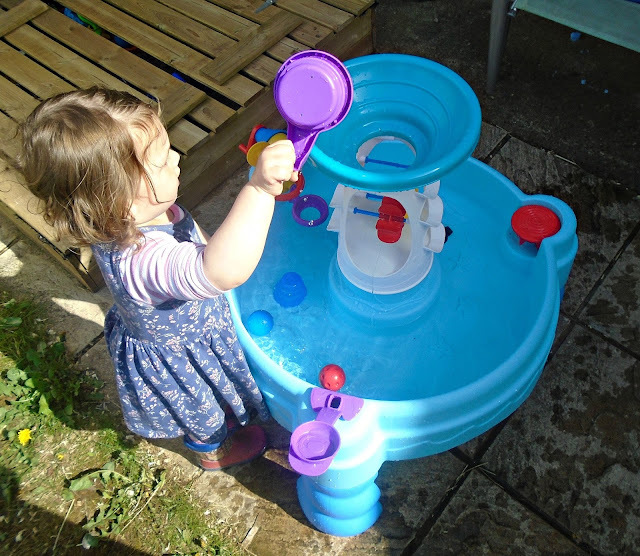 When built the water table stands at approx 17 inches tall which is a perfect height for Evelyn who is 2, she found it easy to reach all the bits within the table without struggle or having to lean over or stretch to much. The bright colours on the table make it eye catching and it looks great in the garden! It comes with plenty of accessories including the centre column with a large basin on top which leads to 2 windmill style spinners, simply throw the ball in the top and see where it lands! There is also a catapult to spring the balls in to the water table and a ferris wheel style ball catcher that can be spun around. The Spinning Sea's water table has already provided hours of fun for James and Evelyn and I know it will be getting lots of use for summers to come. 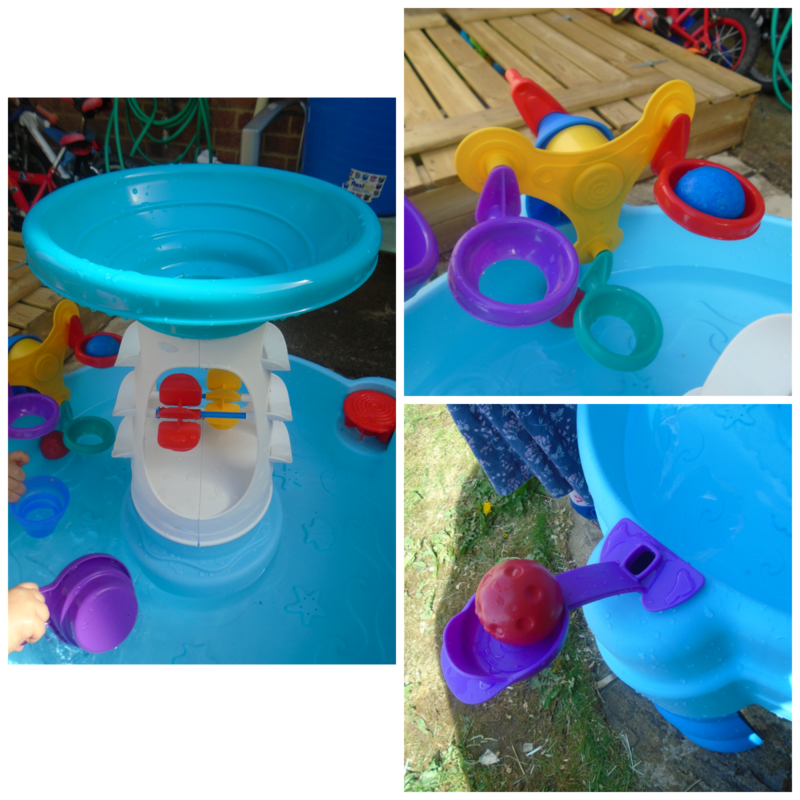 The water table is well built, sturdy and really built to last even against boisterous toddler play as would be expected from a fantastic brand like Little Tikes. If you are looking for something for your garden this year I would highly recommend the spinning sea's water table as it provides hours of fun and doesn't take up a huge amount of space (especially important if you have a smaller garden like us). My children are aged 2 and 6 and both enjoyed splashing around in it. Do your children love being in the garden? What is there favourite outdoor toy? That's so cute! The kids at nursery would love that. I think my 6 year old would still play with it lol. I have seen these over the last couple of weeks and I am seriously considering getting my girl one for the summer....She loves water! These water tables are fantastic for kids, such a great way of learning without even realising it :) Enjoy the summer! What a brilliant water play toy. I loved Little Tikes toys when my girls were young and we still have a couple of them going strong in the garden nearly 10 years on! This looks so fun, it will be great now it's sunny outside. Oh that looks fun for young children. Great design too. This looks so much fun. And perfect for the current weather too. This looks like great fun, bet Mr Squishy would love one.